We all know the importance of trees. They keep the environment clean and provide us with shelter. Then, there are fruit trees that also provide us with fruits. There are approximately 247 billion trees in the U.S alone that are over 1 inch in diameter, as per the last forest inventory report, and a large portion of these trees bear edible fruits. This gives them an edge over other trees, but if fruit bearing trees are more advantageous, then why don’t we only grow fruit bearing trees? This is because it is easier said than done. Growing fruit trees involves looking at a number of factors. 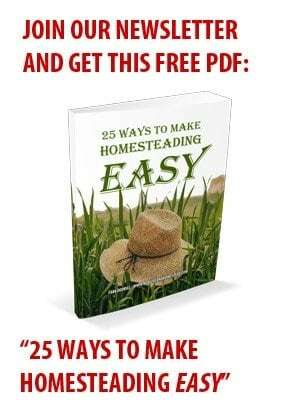 It is not as easy as growing non-fruit bearing plants. First, you need to look into your garden zone. If it’s a mini orchard then go with a dwarf fruit tree ( 8 -10 feet). For medium sized gardens go for semi dwarf trees (10 – 20 feet) and if you have a large garden then go for full sized fruit trees (20 feet or more). Checking the soil; if it’s unsupportive to the fruit tree then you need to adjust the PH level by adding a few ingredients discussed later in this article. Lastly, choosing a suitable time to plant fruit trees. The best time to plant fruit trees is in spring because winters can prove to be harsh for these fruit trees as they are typically in dormant state during winters. This guide covers everything you need to know in order to grow fruit trees. The most common types of fruit trees grown are oranges, peaches, apples and grapefruits. As per the U.S Department Of Agriculture, more than 2 million deciduous fruit trees are planted in the U.S, with oranges said to be planted over a million acres. Moreover, apple trees are very famous as well with 2500 different varieties of apples being grown in the U.S.
Why Should You Grow Fruit Trees? The reason is obvious – to have our own yield of a variety of fruits. Purchasing fruits from the market can be expensive and you won’t be fully satisfied with the quality too. That’s why growing your own fruits can be a viable solution to this. Another reason to grow fruit tree is that it will boost the value of your home. Property experts say that the value of a home is drastically affected when there’s a tree in its boundary. A tree provides a soothing shade, improves the look of the house and blocks any unsightly view from the neighborhood. 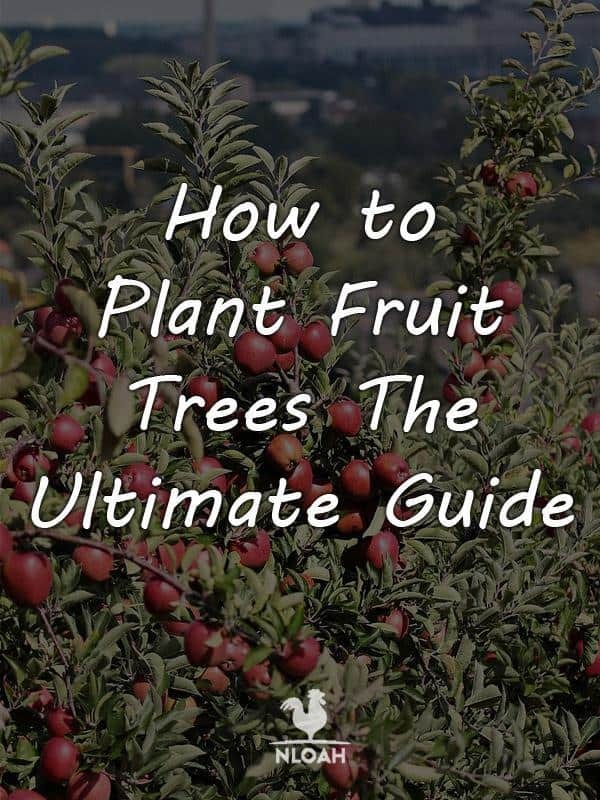 When you want to plant fruit trees, there are several factors that you need to consider if you want to have the tree grow perfectly and provide you with fruits. 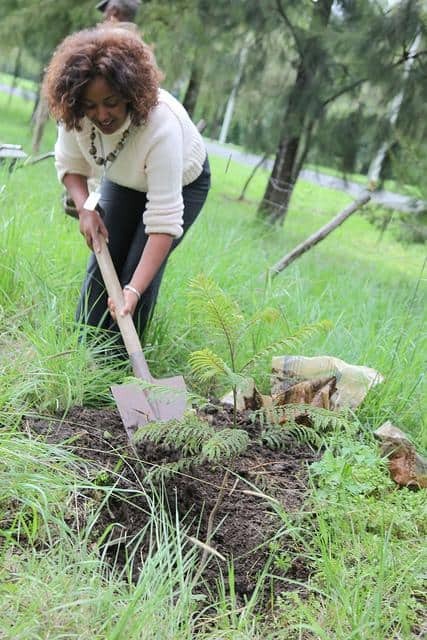 Firstly, you need to ensure the quality of the soil where you’re wanting to plant the tree. This is important because the quality of the soil does more than 50% of the work when it comes to growing fruit trees. Soil plays a vital role in the growth of fruit trees. Fruit trees tend to grow ideally when the soil has a good drainage. According to the University Of California, the topsoil should be at least 3 feet for a tree to grow properly. All three respond differently to growing plants. Clay soil is not suitable for fruit trees because it lacks some nutrients and can stop a tree’s growth. Sandy soil and loamy soil, however, are known for their commendable drainage capabilities. So, we recommend to grow fruit trees in either sandy or loamy soil for good results. Now that you know about the common soil types, you need to know which type of soil you have. Here you can simply conduct the soil squeeze test to know about its type. It involves grabbing a handful of soil and squeezing it. If it forms into a sticky ball then it’s clay soil. If it escapes your fist and keeps falling apart like sand grains then it’s sandy soil. If it forms into a ball but crumbles into a cake on applying more pressure then it’s loamy soil. Check out a past article to help you identify the type of soil you have. Ensure The Soil Has Good Drainage System. It is essential to plant fruit trees in an area where drainage is good which is why you need to conduct a small and easy test to find out the drainage in your land. You simply need to dig a six inches deep hole into the ground, fill in water to the top and let it drain. Once the water has completely drained, repeat the process and note the time taken by the water to fully drain. If the time taken for the water to drain was more than 4 hours then your soil has poor drainage system and you need to call a professional tree company to make amendments to your soil. Checking And Balancing The Ph Level Of The Soil. Trees grow well in soils which have neutral Ph level. Normally, Ph level of soils is measured from 0-14 Ph scale. The recommended Ph level is between 7 – 8 Ph. To check Ph of your soil you can buy Ph checking strips or other Ph kits and use them. In case the Ph of your soil is below 5 then you can add lime into the soil to increase the Ph level. If the Ph level is above 8 then add sulphur to decrease the Ph level. Another important factor to consider while planting fruit trees is to make sure the tree receives at least 7 – 8 hours of sunlight every day. If your plant does not get proper sunlight, then it will not be able to grow properly. Make sure to keep the future in mind when you grow trees. Your plant will grow tomorrow, so make sure it continues to get sunlight where you grow it. The whole tree should get sunlight, otherwise the portions that stay in dark for too long will eventually die, which may affect the entire tree as well. If you’re looking to plant a fruit tree that comes with easy harvesting and produces 10 boxes of fruit at max per harvest then go for dwarf or semi dwarf trees. If you’re looking for trees that can produce 20 or more boxes of fruits per harvest with shade and ornamental value then a full sized fruit tree is your best bet. Space is a vital factor that should not be neglected since a tree requires specific space to grow properly. Distance between two apple trees (full sized) : 30 feet. Distance between two apple trees (semi dwarf) : 15 feet. Distance between two apple trees (dwarf) : 10 feet. Distance between two pear trees (full sized) : 20 feet. Distance between two pear trees (semi dwarf) : 15 feet. Distance between two plum trees : 15 feet. Distance between two cherry trees : 20 feet. Distance between two sweet trees : 20 feet. The distance depends on how big a tree grows to be and how its roots spread. If you are confused about this factor, make sure to consult experts. Bare Root Trees: They are the plants that are pulled out from the ground when they don’t have any leaves. Once taken out, their roots are carefully cleaned so that there is no soil left. This is usually done by shaking the roots. Then, the plants are kept in moisture such as sawdust so tHat they can cool down. Once cooled, they are easy to ship or store. They are usually sold in the dormant winter season as bare root stock. They are small, young trees with root systems but no soil attached to them. The best time to plant these is in spring so that they do not fall prey to winter injury. Make sure you begin the process of planting them as soon as you buy them which is why it is important that you buy them when the climate is warmer. Container Trees: These trees are short, therefore, can be placed in containers. The containers are mainly pots (4-6 inches wide) and are usually used for decorative purposes, but can also yield fruits. They don’t typically require much maintenance. These come in various containers but commonly in pots because their roots are attached to the soil, hence, a pot is necessary. Unlike bare root trees, they can be planted in every season, however it is recommended not to plant them in summers as they may not be able to bear extreme heat. The ideal weather is when there’s good amount of sunlight but it’s not very hot. Also, avoid rainfall. Moreover, it should be noted that container trees come with tied root balls and you need to untie them when planting them. You also need to consider the climate of your region/area and choose the fruit tree to grow accordingly. Different fruits grow in different weathers and are also prone to diseases, which is why, you need to pick fruit trees according to your region. Pest Problems In Apple Trees: Apples can get scabs. Plus, the tree may also get attacked by pests like the codling moth, apple maggot and fire blight. Hence make sure you spray weekly to keep these pests away. Pest Problems In Apricots: If apricot tree is open to too much sunlight, the fruit may get affected and rot. Plus, the tree may also catch infectious bacteria. Make sure you prune this tree in summers only if you wish to prevent it from catching the infamous eutypa infection. Pest Problems In Peaches Trees: Can sustain peach curl disease which is a fungal disease and can destroy the entire tree. Pest Problems In Pear Trees: Similar pest threats like an apple tree. Make sure you spray for codling moth, fire blight and scabs on a weekly basis. Pest Problems In Apple Trees: Can catch borers, attract mites and brown rot if left uncared for days. Now let’s have a look at the whole process in simple steps. Step 1: Make a hole into the ground which is three times bigger than the roots on your tree. The depth of the hole plays an important role because there needs to be enough room underground for the roots to grow. To do that, pick the longest root on the fruit tree, measure its bottom to know the depth for the growth. Once you’ve dug a hole, fill it with soil to the base. If your tree is a dwarf tree then you might want to place a stake for support. Besides supporting the tree, it will also ensure that the roots remain safe and away from any damage. The right way to place a stake is to plant it 3 feet under the soil level in a way that it reaches the lowest branch of the tree. Step 2: Place the tree into a water filled container for at least an hour. Next, ensure that there are no damaged shoots along the branches. If there are, then use a sharp secateur and remove the damaged shoots. Make sure that the cut you make is above the bud so that a new branch can form easily. Lastly, look out for branches that seem longer than 15 inches. If there are some, then cut them off with the help of secateurs but with care because a wrong cut might end the tree’s life. Step 3: Place the tree gently into the hole that you dug earlier. Make sure the roots are spread out correctly and the soil level’s good too. Once the tree is placed into the soil, move it vertically (up and down) in the soil as it will help to remove air pockets and also settle the tree into the soil . Step 4: When you’re done planting the tree, water it ASAP. Do it in a way that it reaches deep down into the soil so that the roots are watered properly. You can plant small holes into the soil for the water to pass down. Next, gather some bark, leaves or compost and prepare a layer of mulch around the tree. Mulching is important when you’re planting fruit trees because it keeps plants safe from weed and other organisms. Also, mulch is a water retainer, therefore, it will help the tree hold its place if it rains and also provide water in hot and dry conditions. The mulch should not be more than 3-4 inches. After mulching, water the tree again. Step – 5: Start caring for the tree immediately. The first year of the tree requires great maintenance. You need to water it once in a week and if the weather is hot then water it twice in a week. The correct way to water a plant or tree is to water the roots. You can dig small holes in the soil and pass water from those holes so that it can reach to the roots. Also, you need to keep your tree well pruned. Pruning is a process that involves trimming off bad shoots, damaged parts of the trees. It is important to do so as one damaged part of a tree can damage other parts as well. Now that you know everything regarding the steps and factors involved with planting a fruit tree, let’s have a look at some of the most viable fruit trees to buy from Amazon. Suitable For: Patios, Small Gardens. This dwarf tree comes in a 4 inch tall pot and can grow up to 3 inches in length. Pomegranate is a great fruit that comes with many benefits. It helps fight several diseases as well, including diabetes and prostate cancer. Keeping this tree in good sunlight and watering it weekly will produce the first fruit in a year or two. If summer’s on peak then increase the water dosage. Good thing about this tree is that it doesn’t require a lot of attention compared to other fruit bearing trees. This sweet fruit tree comes in a 4 inch pot. Sturdy leaves and a 2 inch trunk makes it look adorable, and tiny roots keep it firm in the pot. Caring for this plant is very easy. Buying this fruit tree will get you sweet fruits of medium sizes. It comes in a pack of two and each plant can grow up to 10 – 15 inches in height. Repotting them is very easy because the pot they come in are designed to keep pineapple guava plants. . Fig is a sweet fruit that has a purple brownish skin. The pot you will receive this plant in is 2.5 inches, and normally the plants are shipped in a dormant state and can be placed outdoors too. However, make sure you don’t keep them in strong sunlight. Suitable For: Patios, Medium Sized gardens. The tree needs a good amount of sunlight, excessive water and proper mulching to grow properly. It comes in a 4 inch pot therefore, watering it is easy and so is to keep it maintained and transplant if you wish to. With proper care, it can grow up to 18 inches tall. Suitable For: Small Gardens And Medium Sized Gardens. You get 20 plants wrapped in 2 packs, 10 in each. This one grows very quickly as the plant grows flowers within a month of transplanting it into the ground. Make sure the soil is good and there is plenty of sunlight, otherwise it will not grow smoothly. Also make sure the berries do not touch the ground because they may get spoiled that way. Suitable For: Large And Small Gardens. This fruit may not be regular berries but they are as sweeter and juicy as regular berries. The tree comes in a quart pot, the plant is self-pollinating and grows fruit in 2 years. This plant can grow apples of 3 varieties, namely, fuji, golden delicious and gala. It doesn’t require any pollinator because it self-pollinates and grows itself. All you need to do is keep it maintained, pruned and watered. Make sure you leave space of 15 – 20 feet between the plants while you’re planting. This tree can grow up to 1.2 meters in length and starts producing oranges in just 12 months. It’ll come as a 4 ft. tall plant and is very easy to maintain with less maintenance cost. It comes in a 3 gallon pot and produces mandarin oranges, also referred to as Christmas oranges. They are ideal to grow because they contain less acid compared to regular oranges. It is 2.5 feet tall when you buy it and can grow up to 3 feet tall. It is common for people to buy fruits from the market, but it is not the most preferred way to get fruits. It can add to your expenses since fruits are sold at a markup. Planting your own fruit trees can save you the money you spend on fruits. Let’s talk about apples as they are one of the most grown fruits around the globe. According to a study done by the University of Illinois, an average apple tree can produce at least 20 boxes of apples weighing 42 pounds each per harvest. Imagine the cost of buying that much apples! You can save that amount of money by planting your own fruit tree. Also, the fruits you grow are organic, which means there is no health risk associated with their use. Whereas, the fruits you buy from the store are often grown in the presence of insecticides etc. Apart from that, spending money on fruit trees is actually an investment that will pan out once the tree fully grows. Firstly, it will help reduce your energy bills; its shade will keep your house warm in winters, while in summers it will pass cool air into your home. As per the USDA Forest Service, when you place a fruit tree or any tree in your home’s surrounding it can save you 30% of air conditioning costs as they pass chilled air and control the temperature in the surroundings. Also, 30% to 50% on heating costs can be saved too. Planting a fruit tree can help to keep the surroundings clean and fresh. This is because plants inhale carbon dioxide and the various kind of pollution in the environment and exhale fresh oxygen. It won’t be wrong to say that fruit trees are our environment filters just like we have water filters. So another great reason to plant a fruit tree. Moreover, pollinators and wildlife are also attracted towards fruit trees and help to enhance the beauty of your backyard or wherever it is that you grow a fruit tree. If you’re looking to upgrade your homestead and enhance the value of your home then planting a fruit tree is what you should go for. Not only would it give you healthy fruits to eat but might also decrease maintenance cost of your house by keeping your home cooler in summers and warmer in winters. Let’s not forget the universal benefit here, pollution reduction. Trees help keep the environment clean and even reduce natural disasters. Now that you know how to grow fruit trees, it is time to plant your first fruit tree. We recommend you pick one from our list of fruit trees as they are of high quality and provide great fruits.